Barcelona dearly missed Lionel Messi and Luis Suarez as the La Liga champions were held to a goalless draw at home to nine-man Malaga on Saturday, missing the chance to go top of the standings. Messi was taken ill before the game while Suarez, joint-top scorer in La Liga along with the Argentine, was suspended. Captain Andres Iniesta was also injured and Luis Enrique's side were incapable of prising open a Malaga side happy to sit back and soak up pressure for the majority of the game. Barcelona stayed second on 26 points, one behind leaders Real Madrid, who visit local rivals Atletico Madrid later on Saturday. Despite dominating possession Barca struggled to carve out many opportunities and on the rare occasion they created a chance, Malaga goalkeeper Carlos Kameni was there to frustrate them, clawing away efforts from Gerard Pique in either half and producing a sensational save to deny Neymar in injury time. 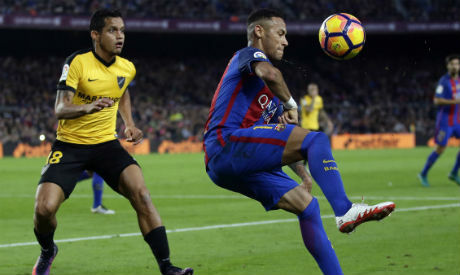 Malaga had defender Diego Llorente dismissed in the 69th minute for a straight red card following a lunge on Neymar, but Barca still could not find a way through, although Pique had what looked a clear penalty appeal turned down after his shirt was tugged in the area by Mikel Villanueva. Neymar was one of few Barca players who looked capable of finding a winner but found few willing partners, with stand-in striker Paco Alcacer produced an anonymous display and defender Pique looking far more threatening in attack. Malaga have proved difficult opponents for Barca recently at the Nou Camp, beating Luis Enrique's side 1-0 in February 2015 and only losing 1-0 last season. They frustrated the Catalans again by employing a conservative 5-4-1 formation and defending deep for most of the game, although they created one clear-cut chance, midfielder Juankar firing wide of the near post after rounding Marc-Andre ter Stegen. Malaga's Juankar was shown a straight red card in stoppage time for dissent. Earlier on Saturday, Gabriel Mercado scored a controversial stoppage-time winner as Sevilla produced a sensational late turnaround to come from two goals down to win 3-2 at Deportivo La Coruna and provisionally go third. Deportivo were denied a penalty late in the second half while leading 2-1 when Argentina international Mercado pushed Florin Andone over in the area. Mercado escaped a possible red card and netted from close range in the 92nd minute after Vitolo had levelled in the 87th.